Our strategy: don't talk about the design process, DO THE DESIGN PROCESS. We pulled the chairs away and enforced a standing-room only. On the table lay our materials, and we guided the client from one step to the next all along the long length of the table. ...and we mainly focused on storytelling and the creative process. 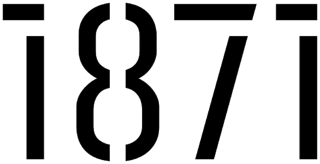 A short time after we learned that we had won the project, long before anyone knew (including us and the client) that it would be called 1871. Tours of other such cooperative environments followed. We visited incubators, accelerators, coworking spaces, even coffee shops—any place that could teach us how people were connecting, collaborating and getting work done in non-traditional workplace environments. 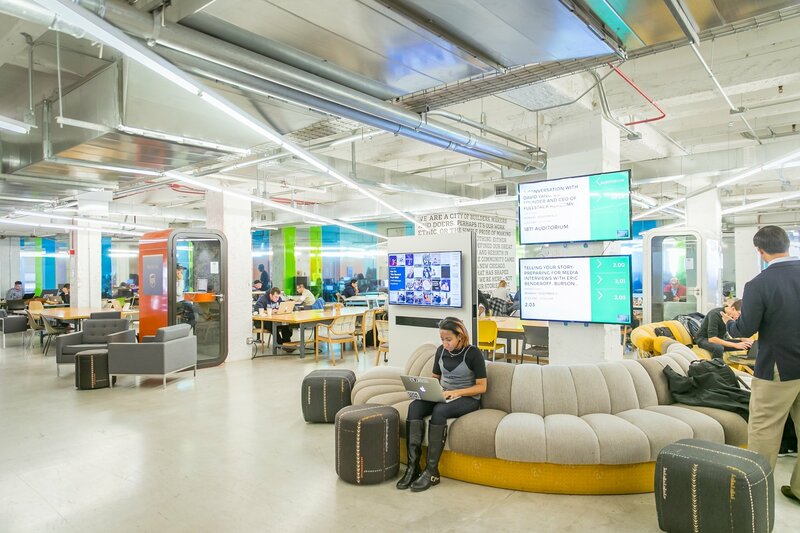 We wanted to understand the "secret-sauce" of how these highly compelling work spaces, from the amenities they offer to the entrepreneurs who use them, work. After meeting with the project stakeholders to gather feedback, we assembled our research into a vision document that would guide our work as we moved forward. As we started to define the essence of the space, we considered the amazing innovations Daniel Burnham assembled to make the grand plan of Chicago the model for the "modern city". We thought about Chicago’s grid, how the river both defines and coexists, the lake's edge, and even the city's motto: “urbs in horto,” (City in a Garden). And at the end even the final selection of the building, the Merchandise Mart with its unique location at the convergence of the three branches of the river, fit perfectly into our story. As work progressed, each Wednesday morning a rotating group of entrepreneurs joined us at 7:30 AM for an informal session we called "Danish and Design". They offered opinions, point of view and advice, and this interaction created a highly informed and user-centered solution, reflecting a collective voice. Materiality, color, and furnishings played a big role at this stage, allowing us to sculpt a space that brings Chicago's unique energy and ambition into our digital present. And with our wonderfully talented and collaborative friends at VSA, we thought we thought about what happened in the months and years following the Chicago fire of 1871. Using this metaphor from our illustrious past, and the drive and pursuit for innovation that has defined Chicago since, 1871 came into full focus. A Firmwide Leader of Gensler’s Consumer Goods Practice, Todd utilizes his impressive architectural background and interior design experience to promote in-depth integration of spatial design and planning, materials and detailing. As a Design Principal and Studio Design Leader in Gensler’s Chicago office, Todd is engaged in the design of next-generation corporate workplaces and co-working environments. Always striving to expand his design reach, Todd is actively involved with the professional design community, serving as a Board Member of the Chicago Arts Coalition and providing pro bono design services to organizations such as City Year and the Marwen Foundation. He holds Master of Architecture, Bachelor of Architecture and Bachelor of Interior Design degrees and received the Henry Adams Medal from the AIA.